To mould young women as prudent scholars and competent professionals capable of becoming ambassadors of graceful service to their families and to society. * To equip young women to cope with the challenges of the times by fostering self respect and self reliance, promoting divergent thinking and cultivating a knowledge culture. * To ensure the all round development of students by providing value based instruction and skills training. Learn to Serve, Serve with Love. 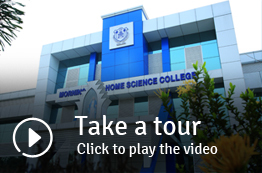 The college emblem is a promise of victory to all its beneficiaries. Designed in the shape of a shield, the emblem holds on its crest a shining star and at the centre the profile of the college guarded by two coconut trees. The star in halo is Morning Star, a synonym for Mother of Jesus, our Heavenly Patroness, showering blessings from the heavens. Each girl here shall take Mother Mary as a model - ready to shoulder responsibilities with a pious heart. The figure at the centre is this centre of learning striving at excellence in academics while ensuring the moulding of morally upright generations with faith in God, trust in values and love for others. The coconut trees guarding the college are symbolic of the uniquely rich floral diversity and cultural heritage of Kerala. Education needs to have sound ecological consciousness to safeguard and sustain this richness of our nature and culture. These trees remind us that everyone is a 'Kalpa Vriksha' invested with immense potentials - bring them out and live a life of fulfillment.